Creating a content marketing system is an important step to marketing your small business. Effective digital marketing must include the frequent use of current content to attract searching visitors. Email campaigns, social media posts, and blog sites must have something to offer the potential visitor looking for information. Make sure you read the full post at the bottom of this helpful Info-graphic. 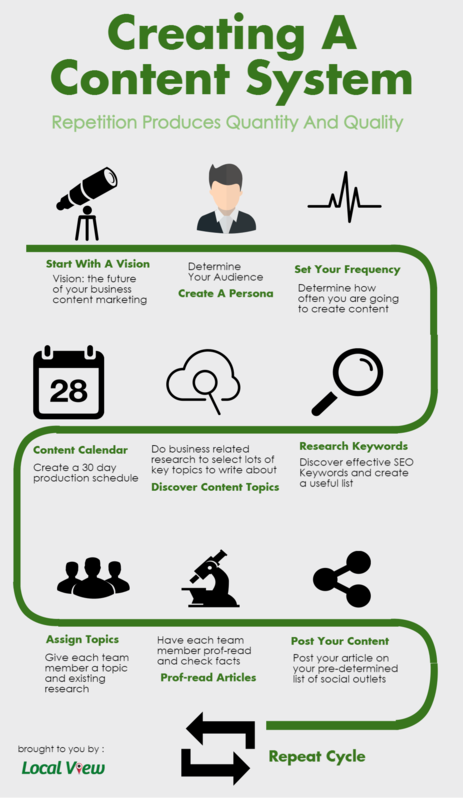 Having a vision of how your content creation will consistently operate is inspiring! Seeing your small business as having a marketing strategy instead of writing an article every so often is motivating. You need this because the producing content consistently is where most business owners fail. So organizing the process will make it last and become part of running your business and as a result you will increase your business. Frequency is more about goal-setting than anything else. This process needs to be realistic but should stretch you like any other process of goal-setting. Start by knowing your own limits and assigning time each week to accomplish this. Then set how often you will produce articles. How would your persona describe themselves? What is your persona’s job level or level of seniority? What does your persona value most? What are they trying to accomplish, achieve, or are working towards? What are their pain points? What problems are they struggling with that you can help solve? What are their most common objections to your products or services? How old are they, and what is their income range and education level? What experience are they looking for when seeking out products or services like yours? There are many people who will say that the quality of your content is the only thing you need to be concerned with. While quality is most important, knowing what keywords people are searching for and creating topics that are in your business goals from those keywords just makes sense. Marketing is all about exposing your business to those who are looking for what you are offering. Using keywords derived from Search Engine research is one of the most important aspects of Optimization. The most important process for creating content is selecting what to write about from the various keywords you have found during step number four. There are many other wonderful articles from other people within your industry that can be used when choosing topics to write about. Also, there are many tools that can be used to compile various topic categories in one easy read place such as this list produced by Brian Honigman at Kissmetrics. Setting up goals during step three (Set Your Frequency) should make this step a bit easier. While I prefer an electronic calendar with email notifications, this step can be done on anything from a whiteboard to sticky notes. But the most important part of this step is sticking to the plan. If you have a few team members that will be assisting, you need to consult with them to create your content marketing calendar. Having many staff members can greatly increase the frequency and diversity of your content. If you have more than 5 team members, you now can produce an article each week without assigning too much content creation to any one employee. Creating a content marketing system that is not a burden on any one person will keep your articles fresh and a joy to read! This step is not only for catching typographical errors, but gets all the team members involved in the content creation process each week. It also helps them to know the heartbeat of the business and learn more about the industry you serve. While this step is obvious, the channels and procedure is important to document. Having your social pages integrated into a dashboard solution such as Local View offers can greatly increase your effectiveness while reducing the time it takes to manage them. Reviewing the steps each month will help you stay on schedule as well as uncover new tools and procedures. Tools and procedures will increase the frequency and quality of the content you produce for your small business digital marketing.